This larger version of the Double Embroidery will be the center piece of any living room in your home. 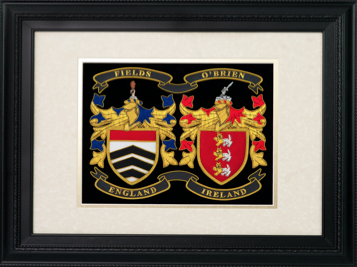 A great way to display your family roots ‑ from both sides of your family ‑ and a fascinating talking point in any home, office or den. We research both your names thoroughly from a database of over 800,000 names of European origin and provide you two authentic histories of your Names plus your Coats of Arms. Two separate, framed Histories of the origins of your family Names. © 2014 Family Roots & David Bustle. All Rights Reserved. Designed by David Bustle.